Congratulations to Dominican Republic & Jackie Robinson RBI for winning the 2012 RBI World Series! Dominican picked up their third consecutive title in the Junior Division while Jackie Robinson Jersey City notched their program’s first title by winning the Senior Division. Oscar Perez, the director of the Dominic Republic RBI program, said the team has been coming to the tournament for the last 10 years and that this win will help them to continue the success by bringing more attention to their team back at home. Dominican Republic beat the Chicago White Sox RBI 5-1 after putting up three big runs in the first inning and relying on the pitching of Pablo Achoa who threw the entire game, allowing just one run after giving up six hits. Achoa’s performance earned him MVP honors for the championship game. Dominican Republic celebrates their 3rd consecutive RBI World Series at Target Field Sunday afternoon. The senior league championship game had a little bit more excitement as Jackie Robinson RBI ended the game with a walk-off single by Willie Rivera to win the title 8-7 over Bradenton. Rivera was also named the game’s Most Valuable Player. For Coach Ron Hayward, the win is more than just adding a trophy to their collection. 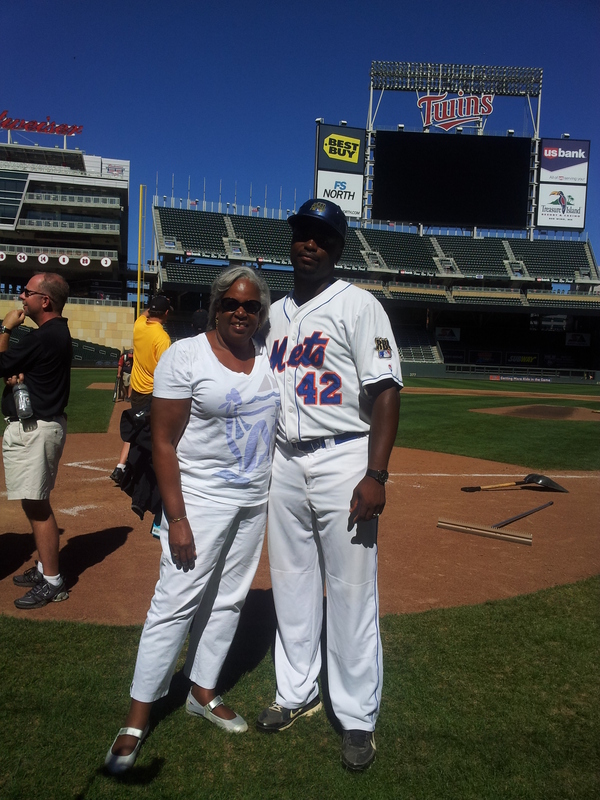 Coach Ron Hayward of Jackie Robinson RBI celebrates his team championship with Sharon Robinson, daughter of the legendary player. Donna Lou, Frank, and Brenda along with “Old” Ben enjoyed the Harrisburg team’s efforts. Proud of the Harrisburg Jr/ Sr RBI Boys Baseball teams. And proud grandparents of Jr player Ben III. Game Stream was next best thing to being there! Thanks!